Carnival Vista is the latest ship to join the Carnival fleet and is a convenient way to experience many awe-inspiring places around the world. Carnival Vista is the latest addition to the Carnival Cruise Line, setting new standards in all categories. Sports, gastronomy, wellness and culture come together at the highest level of this 1063-foot ocean giant. There is a reason Carnival Vista is called ‘the future of pleasure’, with innovative features like the WaterWorks Aquapark, a 360-degree cocktail bar and the SkyRide show. Whether taking a turn on the thrilling Twister water slide or playing a round of Mini Golf, guests will find new adventures everyday onboard the Carnival Vista. Stay fit and active with spinning and Pilates classes at the fitness center and finish with a relaxing massage at Cloud 9 Spa. Art connoisseurs or art curious cruisers art gallery full of intrigue, featuring exhibits and renowned classics as well as piece from fresh new talent. Carnival Vista is the latest addition to the Carnival Cruise Line, setting new standards in all categories. Sports, gastronomy, wellness, and culture come together at the highest level of this 1063-foot ocean giant. There is a reason Carnival Vista is called ‘the future of pleasure’, with innovative features like the WaterWorks Aquapark, a 360-degree cocktail bar, and the SkyRide show. Whether taking a turn on the thrilling Twister water slide or playing a round of Mini Golf, guests will find new adventures every day onboard the Carnival Vista. Stay fit and active with spinning and Pilates classes at the fitness center and finish with a relaxing massage at Cloud 9 Spa. Art connoisseurs or art curious cruisers art gallery full of intrigue, featuring exhibits and renowned classics as well as a piece from fresh new talent. 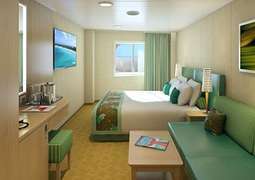 Carnival Vista, the fleet’s newest cruise ship, features incredibly comfortable staterooms for all needs, each characterized by a unique, Cuban-inspired styling and décor. There are Interior, Oceanview and Balcony staterooms available, special family staterooms on offer and a luxurious range of Suites to cater to even the most indulgent tastes. A wide selection of inspiring complimentary and specialty dining options await you on board the Carnival Vista. Fantastic restaurants such as the Blue Iguana Cantina, Guy’s Burger Joint, and the Lido restaurant are complimentary, while the Seafood Shack, Steakhouse, and Jiji Asian Kitchen specialty dining options are a delight to the palate. For kids, the Green Eggs and Ham Breakfast is a must – for a small fee, the whole family can explore a delicious menu, featuring green eggs and ham itself! Carnival Vista is synonymous with fun for the whole family. Experience the thrill of the SkyRide, catch a flick at the IMAX theater, or become a superstar during an onboard Lip Sync Battle. For kids, Seuss at Sea, Camp Ocean, and Hasbro the Game Show provide endless entertainment. Recover from everyday life on board the Carnival Vista with the ship’s great range of fitness and wellness facilities, such as the Cloud 9 Spa, hair and beauty salon, fitness center and jogging track. A relaxed cruise line calls for a relaxed dress code. Daytime dress is comfortable, with evening attire remaining casual. Naturally, however, there are opportunities to dress to impress, with a selection of fine dining restaurants the perfect opportunity to glam up. The Carnival Vista was launched in August 2015 and Vista’s maiden voyage embarked on May 1, 2016 from Trieste, Italy. It was built in the Italian shipyard in Monfalcone. This ship from Carnival Cruises shipping company operates under the Panamanian flag. At a length of 1,062 feet, it can accommodate a maximum 3,936 passengers. The ship has been highly praised for the luxury of their accommodation. Guests are looked after by a crew of 1,450 members. Experience a whole new relationship to sea and sail away to the Caribbean. 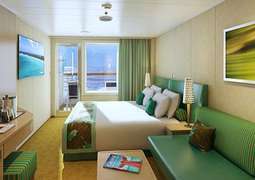 Most cruises last between six and nine nights, and you have got a great start to your cruise from Miami or Galveston. On these cruises you can discover the Caribbean at its best. Mexico, Belize and Honduras are ideal for snorkeling and scuba diving. Discover the fascinating underwater world of the Caribbean Sea on an unforgettable family adventure when you embark on a Carnival Vista cruise from Galveston, Texas. On board the Carnival Vista you and your family will find the perfect way to relax, have fun and keep yourself entertained. There are youth programs for the young ones, and an onboard golf program, the Cloud 9 Spa, and a casino for the adults. One thing is certain on the Carnival Vista – it is a fun-loving cruise liner! 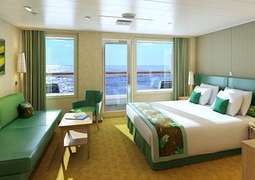 Carnival Cruise Line takes pride in their top-class accommodation and the Vista is no exception. 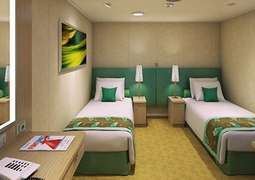 Guests will be treated to unparalleled comfort and luxury as one would expect from such a reputed cruise company like Carnival. Every detail has been designed to provide the ultimate relaxation and rejuvenation. Whatever you decide there is never disappointment on board this marvelous ship.